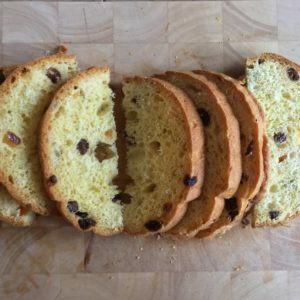 I started w/ a medium size panettone of about 500 g bought in my trusted food store. At first I thought about using the whole panettone, but then I made a touchdown in reality. 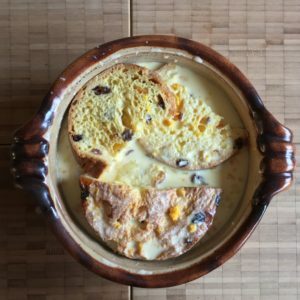 Having in mind the size of the casserole I planned to use & the number of people to indulge in the dessert – mainly my better half & me – I decided to confine me to half of the panettone. 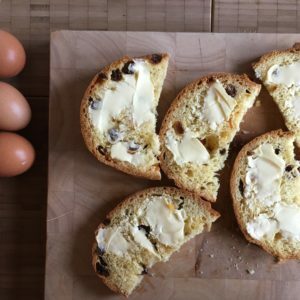 Of course you may also start w/ plain white bread or brioche… Then you’ll have to add raisins, candied fruit like you like it. 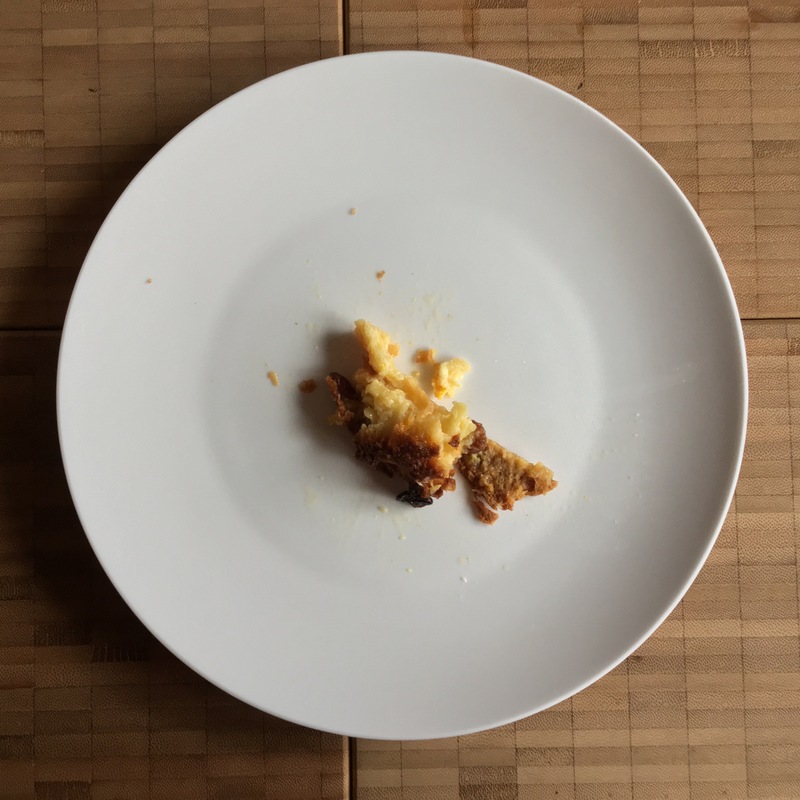 Just cut the panettone into halves & then cut a half into slices like on the photo. Always have in mind that there is another half waiting for you – so resist the temptation to start eating the buttered slices at once! Start w/ preheating the oven to 160° C w/ fan. 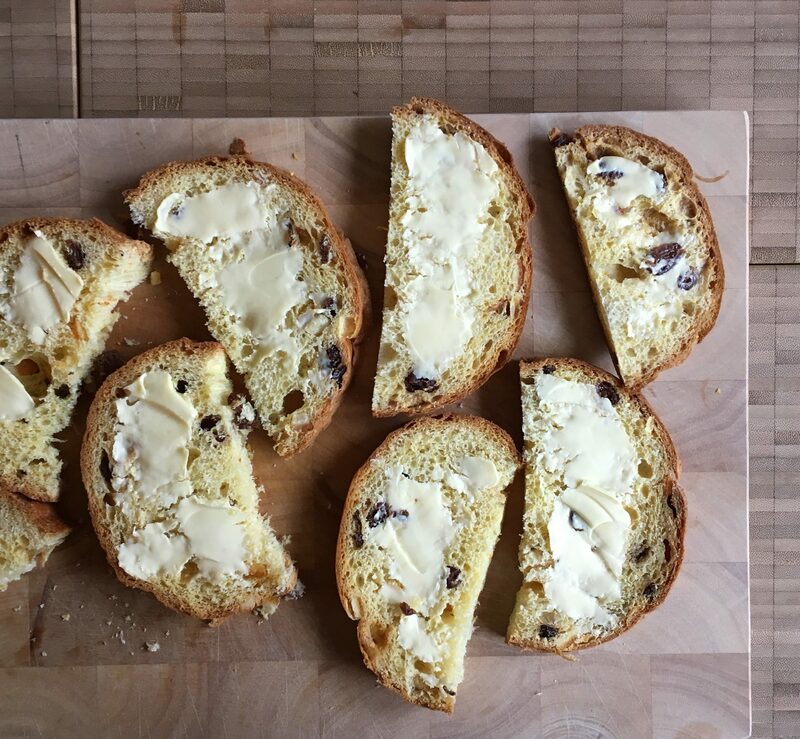 As I stated – once more – make a row of panettone slices & butter them generously. Grate the zest of the organic orange. 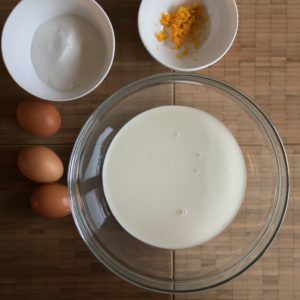 Mix milk, cream, sugar, vanilla sugar & eggs w/ an egg whip. Add the orange zest. 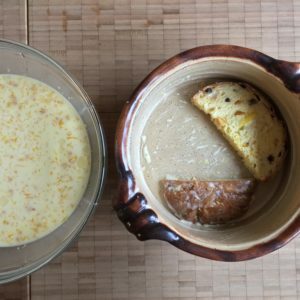 Now: dip each slice of panettone in the liquid & arrange the slices in the casserole. 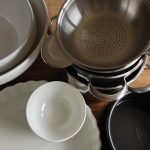 Just stack them up – as evenly as possible. Finally pour the rest of the liquid in the casserole. Add some brown sugar on top – ready to march into the preheated oven. 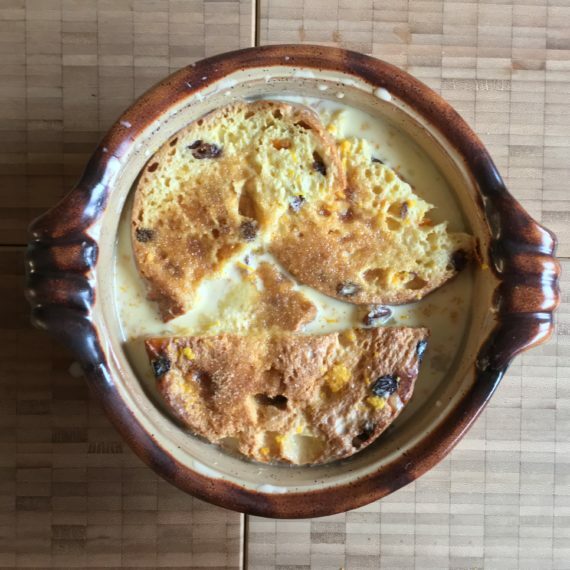 After about 40 min the bread & butter pudding is done. 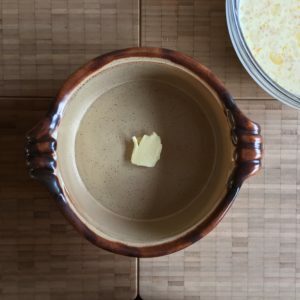 The liquid has thickened & is very creamy when leaving the oven. It’ll set a little more when cooling – even more when resting the fridge. 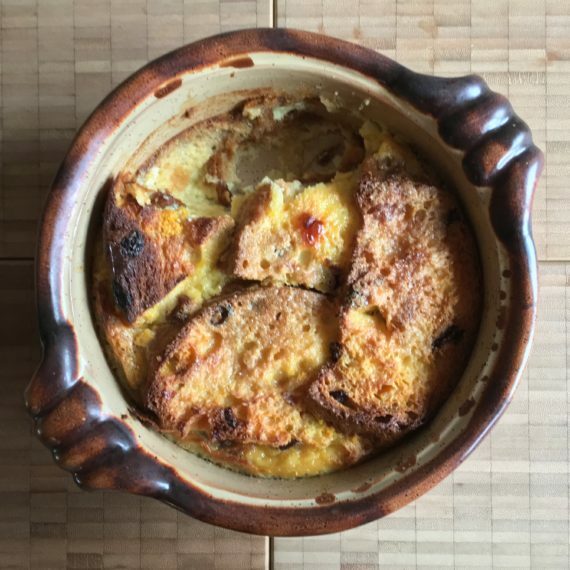 One of the desserts served best hot or warm or at room temperature or out of the fridge is a simple bread & butter pudding - I prefer... which one? Preheat the oven to 160° C w/ fan. 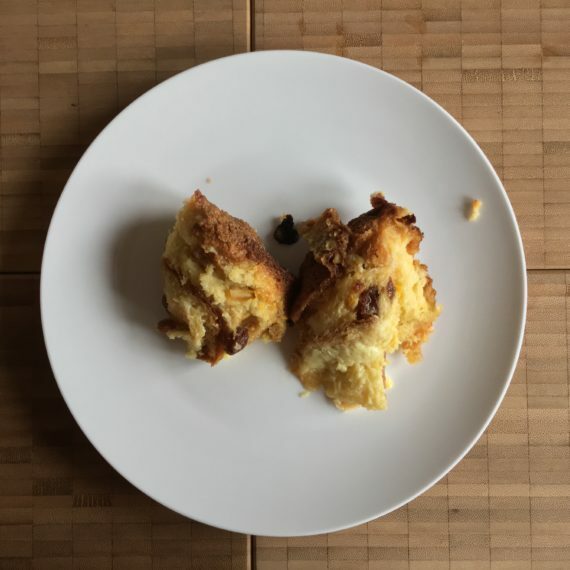 Cut the panettone into 2 halves; set aside 1 half of the panettone for whatever you like - cut the 2nd half in thick slices (about 1.5 - 2 cm thick). 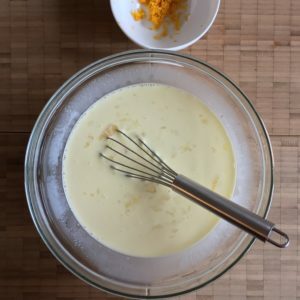 Mix together the eggs, the milk & the cream w/ an egg whip. Add caster sugar, vanilla sugar & orange zest. 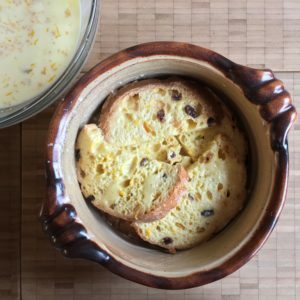 Take a slice of panettone & dip it into the liquid mix (for 1-2 seconds or so) & place it in the casserole. 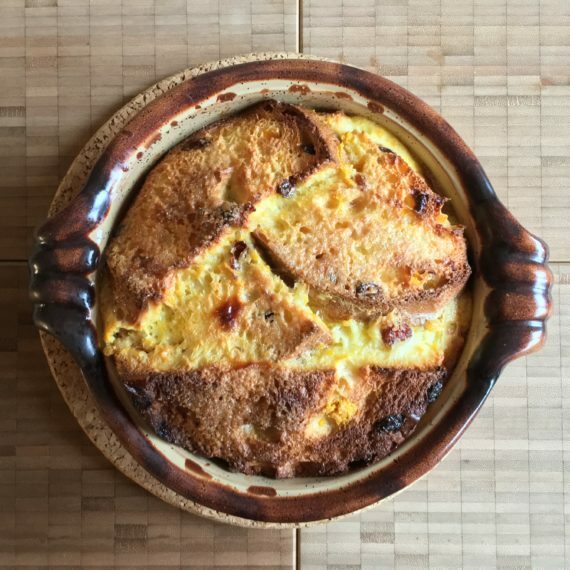 Proceed alike w/ all the panettone slices & fill the casserole. Pour the rest of the liquid in the casserole. Sprinkle brown sugar all over the top. Let it bake in the preheated oven for about 40 min. 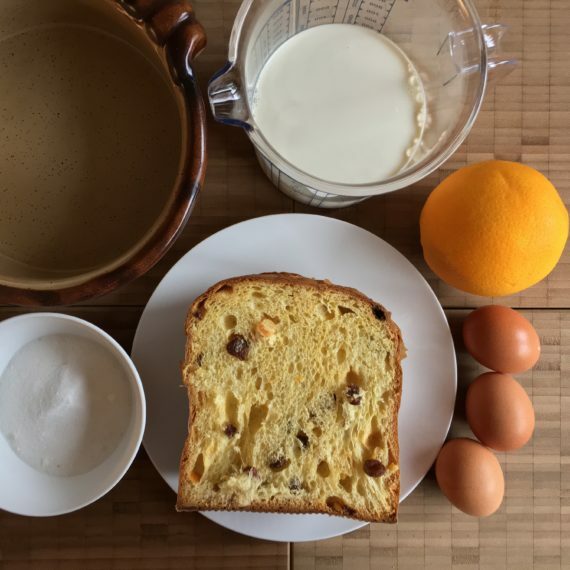 Panettone: I work w/ the original panettone i. e. panettone w/ raisins & candied orange & lemon peel. There are also panettone w/ chocolate chips... you may use one of these although the flavor changes! It’s fine in the fridge for about 2-3 days. 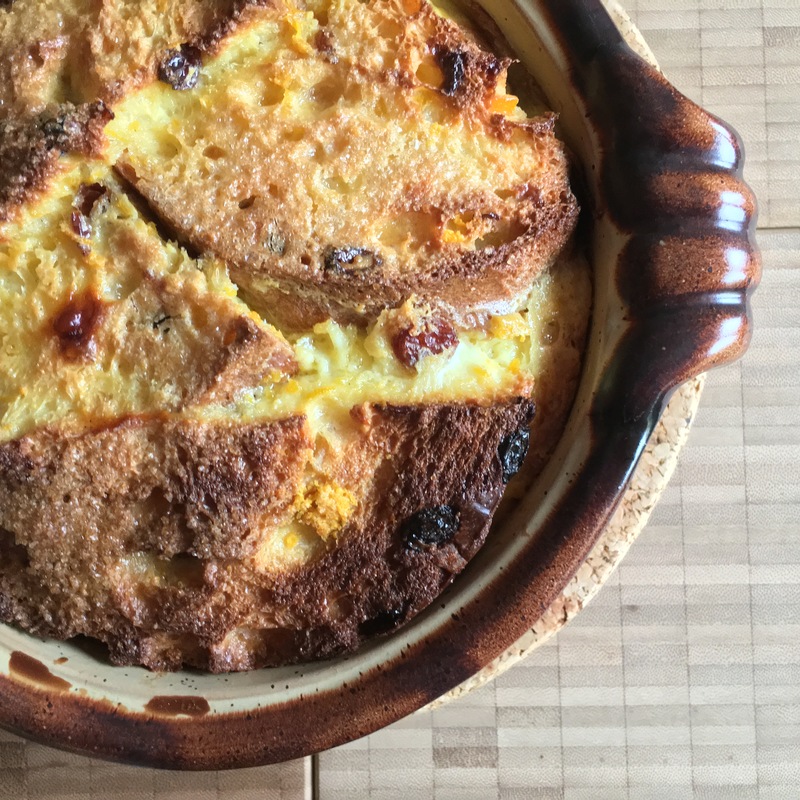 Leave the bread & butter pudding in the casserole & cut out heaps of the delicious mess w/ a tablespoon. You may serve the dessert when coming out of the oven – ok: it’s very, very hot! So better let it set for about 10-15 min. You may also let it cool down to room temperature. In my opinion that’s the best version for the dessert. 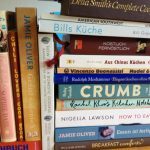 You can store the bread & butter pudding i. e. the leftovers in the fridge. Also at fridge temperature it’s fine! 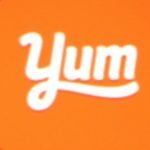 This sounds delicious & easy & fast. I like panettone very much & honestly I’m always a little disappointed when Xmas season is over & the last panettone vanishes from the shelves of my trusted food store.